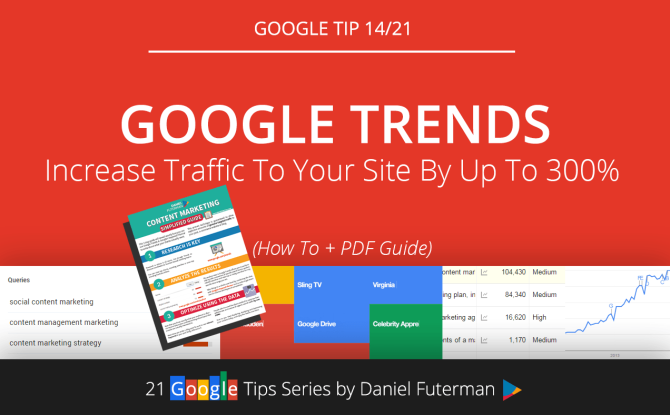 Be sure to check out this absolutely phenomenal write-up by Daniel Futerman on increasing traffic to your site and using Google Trends to do so by up to 300% and in ways you may have never initially imagined! I, myself, managed to boost traffic not only to this blog but also to my seller sites - i.e. eBay & Amazon stores - by roughly 235% after only a few days of implementing a few of his multiple and brilliant tips. Google Trends is a masterful tool by itself and even more effective for driving more traffic to your site and ultimately increasing the probability of those additional visitors buying your product(s) or resell items and in turn, notably increasing your ROI and/or Profit Margin, in general. Remember how back in tip #1 we talked about people performing over 100 billion Google searches each month? Well, in this post we’ll see how this one Google tool can transform the way you select your blog post topics, help you learn about your audience interests and use this technique to drive explosive amounts of organic search traffic to your post, e-commerce website or blog – a key element to the successful growth of your business. Check out COMPLETE ARTICLE Here! Thanks for visiting and be sure to leave a comment with any thoughts, ideas, suggestions, experiences and/or tips of your own!